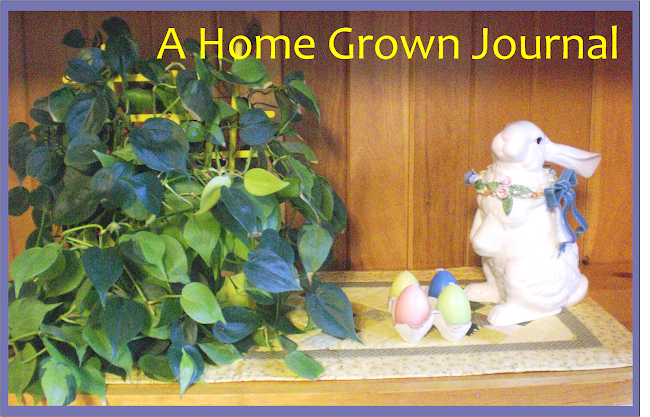 A Home Grown Journal: Succumbed Again! Aaanywho, my love of creating is still very strong and there are few kinds of handwork I don't have an urge to try. You must understand that only a short time ago I had given myself a couple of lectures on how, perhaps/maybe/probably, I should limit myself to just one choice of handwork so I could actually get more completed and, therefore, feel a real sense of satisfaction. You know, instead of having several (way too many) projects going at once, but feeling as though I completed very few. I should, I reasoned, confine my endeavors to only knitting. Or quilting. Or cross-stitching. Or what about my rug making? How do I like my new endeavor? Love it. But then I've always enjoyed embroidery. (Who else's husband had embroidery all over the collar, across the back yoke and down the front of his work shirts in the 1970s?) And embroidery does, indeed, come into play with wool applique. Here's my first attempt. A bit of a learning curve to it all, but I'm willing to continue navigating it. I took the basic idea from this design . . .
. . . in this book I ordered. And a couple other stitches I need to brush up on. 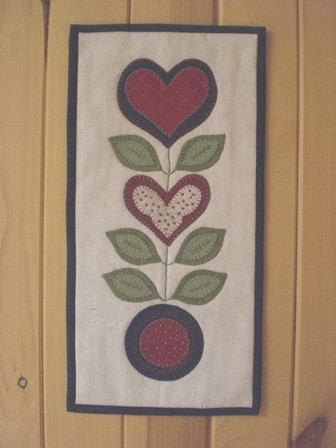 I would rather have had a large piece of felted wool on which to mount my little leaf/heart/flower design thingie, but didn't. Next stop, our local second-hand resale shop to look through their fabric bins. Wanna come along, Susan? No telling what goodies you might find! 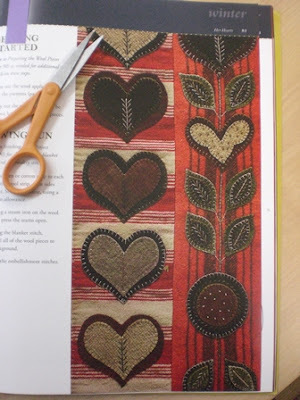 Wouldn't mind having a go at applique myself, but with fabric rather than wool. I have a corduroy skirt that I want to make, putting some sort of applique around the hem area to brighten it up! 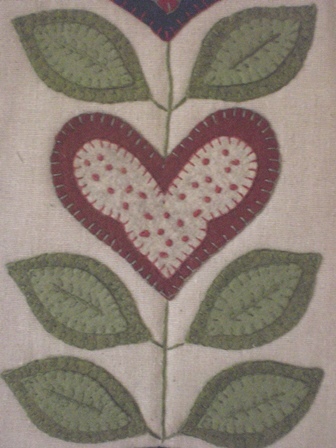 Vera - I have done appliqueing with cotton a bit and find working with the felted wool much easier. Although you certainly get a different look with the cotton applique. I like that on quilts especially. Wow - that is your ~first~ attempt? It is quite stunning and I'd be delighted to have finished something so neatly. As a professional furniture restorer and furniture maker, I thought you said 'wood applique.' Whata mistake. Wool sounds fun too, though. Go for it! Does our background affect our thinking???? It's gorgeous! You did a wonderful job! I have some wool applique projects around here and also wool rug hooking....I love it all! I don't think I have that book...hmmm....may have to think about that one! LOL! At least you start and finish something which I am trying to do but it's slow when you have so many projects you're dividing your time among. I really am trying to finish up some long lingering projects this year. 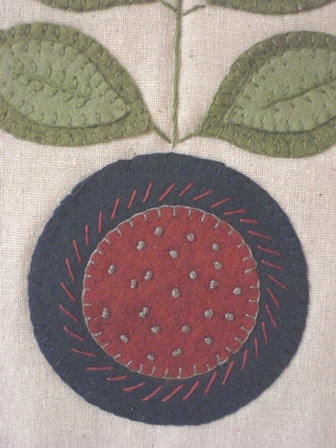 Jayne Hill - I confess I've done a bit of embroidery before so that all came pretty naturally. And I found the felted wool so much easier to work with than cotton. Thank you for your nice words and thanks for commenting! 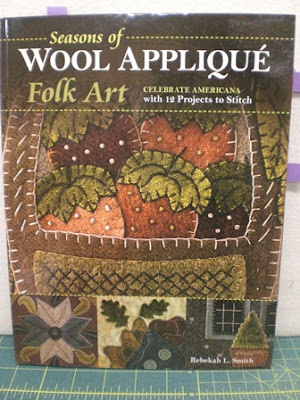 Tim B. Inman - Can we classify wood carving as applique work? Maybe that's stretching it a bit. Your craft is one I admire but would never attempt! Thank you for your comment. Sam I Am - I'm sure the only reason I finished this new project was because I was so eager to see how it would turn out! 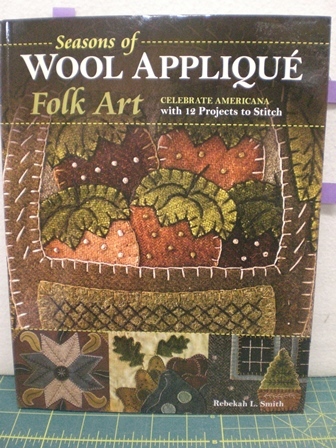 I've been looking through books on appliqueing with cotton to see if I can find a design I like and could use for more wool applique. So fun! In the fiber world Susan would be called an "enabler". Thank God for those that enable so that we who do may reach our highest level of creativity. It's beautiful! I always have more projects going than I should too. That is creative genius, Mama Pea! Good for you Mama! Keep on learning! But me being me, all that stashed stuff, kind of rankles my "KonMari" tendencies. I will offer to come "over," and clear out some of the Old Stuff, for you. That's so lovely. Great job. you must be a fast learner.We all should do what we really want to try. 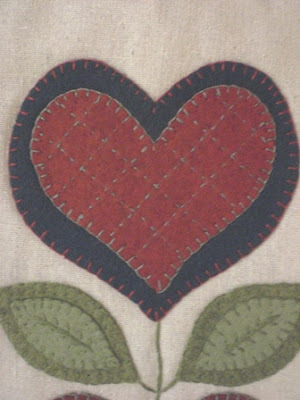 I think it makes us happier, and that's how our minds grow.I've done regular Applique butnever trid doing it with wool. Keep it up! can't wait to see the next one!! Cockeyed Jo - My heart is always happy when I'm creating. And thank you! Kristina - Many projects do keep us interested! Lynne - Uh-oh, the pressure is on! ;o) Having done a bit of embroidery definitely helped with the wool applique. Mama Pea... YOu just gotta' get caller ID. New phone maybe, to get it but... YOu will love it to bits, when you do get it. Here... We have our land line set to shortest number of rings. And have caller ID answer it. :::: Everyone who matters, knows we do this, and will leave a message, which we can reply to. Plus we tell anyone else (like doc offices, etc., etc.) that we do this. And for them to leave a message. We look, when we get to it. Or, if we hear it, and it's family, we go pick up. But all the ROBO-CALLS get NO answer! 'Cause if they do, you are known as a "live one". Or some such. And more calls will come. Plus, your phone number is sold around, and more and more calls, will come. It is a vicious business! Especially since they prey on older people!!!! If one still has their "marbles," they know it's crap. But! If an older person is not quite so sharp anymore...... Then they can get roped into spending money, or worse. Gotta' fight 'em, any way we can! Please consider getting caller ID. As a detailed oriented person, (as are you) the paint by number set gets my vote for your new hobby! I always loved coloring and I ALWAYS outlined the picture before I began! It just seemed so crisp to me and highlighted what was colored in the interior. Talking about needing a shrink at a young age...LOL!